These plug-ins has been conceived to provide you with versatile compressors that offer detailed control and an exceptionally musical sound. PSP oldTimer plug-ins are not based on any specific hardware, rather they are inspired by vintage circuits and we designed them to emulate our favorite characteristics of such compressors. 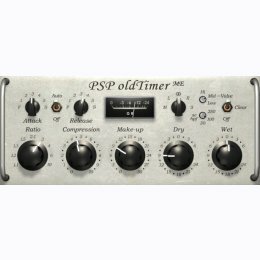 PSP oldTimerME version of this compressor combines advanced features such as the option to process left, right, mid or side channel exclusively while being very simple to set up - which makes it hard to go wrong! In case of PSP oldTimer our goal was to provide a simple compressor that offers an exceptionally musical sound while requiring a minimum of tweaking. PSP oldTimer is so simple and so easy to use, that it's difficult to make it sound bad even at extreme settings! These compressors offer soft and smooth compression in most applications, however they may slightly color the sound with their tube emulation on transients when heavily driven internally by high compression values. Trial versions are fully functional and run for 14 days after installing. Download PSP oldTimerME trial version here!